Concentrate on the details and stories of these illustrations. Define the word RIVAL. (A person who competes for the same thing as another.) Point out that the other artists, whose work is also found in this packet, were not competing against Norman Rockwell, or trying to be BETTER than him. Robert Gunn, Robert Tanenbaum and Leslie Thrasher were just a few of the many artists who admired and tried to capture the STYLE of Norman Rockwell. These artists tried to capitalize on the enormous popularity of Norman Rockwell’s individual style. The paintings of the other artists have the same appeal the Rockwell paintings have, imitate the same subjects and even tell some of the same stories. Yet, even the artists who created the other pictures knew there was only ONE Norman Rockwell! Discuss and compare the differences between some of the Rockwell illustrations and the “Rockwell Rivals”. Point out differences in the MOOD of the various illustrations. Ask questions that will encourage the class to NOTICE AND PAY ATTENTION TO THE MANY DETAILS Rockwell used in most of his pictures. Be sure ALL 14 pictures are returned to the Packet Carrier after your presentation is finished. Norman Rockwell is famous for his humorous paintings of everyday life in the United States. He depicted people experiencing the joys and problems of everyday life with humor and sympathy. Although his paintings show life in small town situations, Rockwell was born in the heart of New York City, on February 3, 1894, and spent most of his life there. His family lived in a fifth-floor apartment in a rough neighborhood. Norman’s father worked hard at an office job and his mother was often sick. Norman and his brother, Jarvis, had to learn to be quiet and entertain themselves. Summers were the happiest part of Norman’s childhood. Every year, the family went to a farm outside of New York City for a vacation. Norman and Jarvis could run, swim and go fishing. They also helped with milking the cows and other farm chores. Norman was a skinny kid who had to wear thick glasses. Even worse, he was clumsy. The boy’s in Norman’s neighborhood loved to play baseball and football in the streets and vacant lots. Norman was not an athlete so he didn’t really fit in. Yet, Norman could do one thing very well. At the age of only four or five years old, he began to draw. At night the family gathered around the dinner table. By the light of a gas lamp, Norman’s father read aloud from books by Charles Dickens. While his father read, Norman drew scenes and characters from books such as David Copperfield and Oliver Twist. In school, teachers asked Norman to draw pictures to go with his reports and to decorate the blackboards with drawings for holidays and special occasions. Norman entertained his classmates by drawing pictures and by the age of 14, he had decided that he wanted to be an artist, so he enrolled at The New York School of Art. “I think I always wanted to be an artist,” Rockwell said later in his life. “I certainly can’t remember ever wanting to be anything else. Norman’s parents didn’t encourage him because they thought he would never be able to earn a living as an artist. This only made Norman more determined. He understood that he would have to study and begin working at part-time jobs to save money for art school. So, Norman left high school at 16 and went to study art at the National Academy of Design and then at the Art Students League. At this time he illustrated his first book and also earned money drawing greeting cards. Norman knew he would have to support himself with his art so he studied to be an illustrator. An illustrator creates drawings and paintings for books, magazines and advertisements. These pictures must be easy to understand and appeal to a large number of people. At 19, Norman became the Art Director of Boy’s Life magazine, the official publication of the Boy Scouts of America, and contributed illustrations to other magazines and books as well. 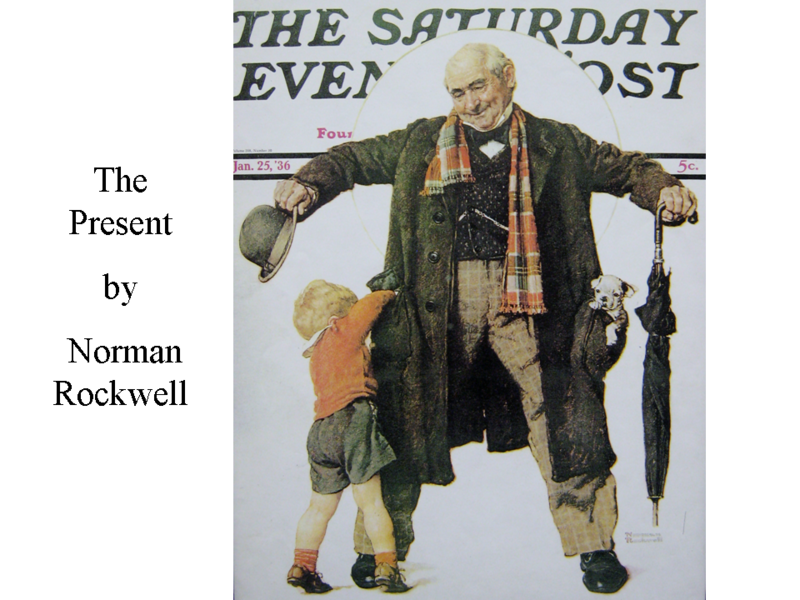 On May 20, 1916, at the age of 22, Norman Rockwell’s first Saturday Evening Post cover appeared. Norman Rockwell painted covers for the Saturday Evening Post for 47 years (until 1963) and provided more than 320 total covers for this magazine. Rockwell also contributed artwork to other magazines over the years, including Collier’s, Life, Country Gentleman, McCall’s, Look and Literary Digest. Earlier in his career, Norman also painted advertisements for companies such as Fisk Bicycle Tires, Jell-O, Orange Crush, Post Cereals, Sun-Maid Raisins, Purina Cat Chow, Perfection Oil Heaters, Overland Automobiles, Plymouth Automobiles, Ford Motor Company, General Electric, McDonald’s and Massachusetts Mutual Life Insurance Company. 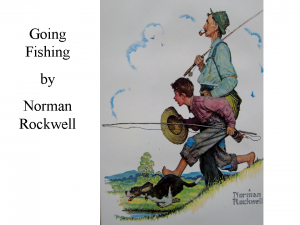 In 1935, Rockwell illustrated the classic Mark Twain stories of Tom Sawyer and Huckleberry Finn. 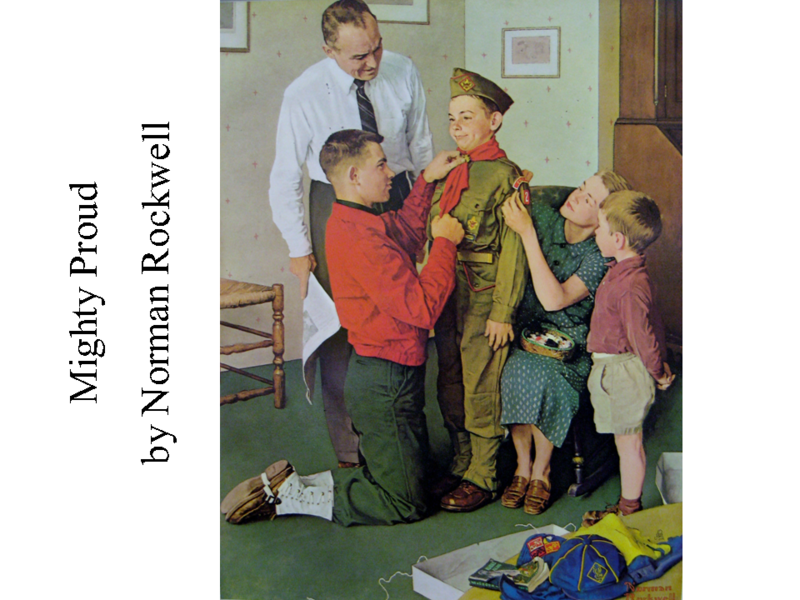 Norman Rockwell’s pictures talk about special times in people’s lives and usually tell a story. He paints about average America. Rockwell loved to paint happy, everyday home-and-family scenes. He painted American people just the way he wanted American people to be—happy! His pictures describe the “American Dream”—the life all Americans hope for. Norman Rockwell painted the good that is universal in mankind: humor, loyalty, compassion for others, pride in country and love of family. Rockwell once said, “As I grew up…I unconsciously decided that, even if it wasn’t an ideal world, it should be so, and so I painted the ideal aspects of it.” While the real world of today may not be as Rockwell painted it, his pictures provide us with a much-needed vision of what the world SHOULD be. It is considered that Rockwell did the most and best work of his career during the 1930’s and 1940’s. In 1930, Norman married Mary Barstow, a schoolteacher, and the couple had thee sons—Jarvis (named after Norman’s only brother), Thomas, and Peter. The family moved to the small town of Arlington, Vermont, in 1939, and Rockwell’s artwork began to reflect life in small town America. Rockwell painted much of the history of America, most of which happened during his own lifetime. From Benjamin Franklin to Willie Gillis (a soldier during WWII—*see Art Discovery Rotation #2 workbook), to Presidents Eisenhower, Kennedy, Johnson and Nixon, to man’s first walk on the moon, Norman Rockwell recorded America’s history on canvas. The paintings that Rockwell created for his magazine covers were usually several times larger than the final reproductions. At first, the backgrounds were very plain but they became increasingly detailed over the years. As printing technology advanced over the years, Rockwell helped in the transitions that the art of illustration had to make in order to conform to the new printing methods and machinery of his day. Norman worked with all the traditional art mediums—oils, watercolor, pastels—but he had to remain conscious of the fact that his work was intended to be seen as a reproduction and not in its original form. The final picture that the public saw was much different than the original creation after it was printed. Before his illustrations reached the public, they had to be processed by camera and then by high speed, four color presses. Rockwell had to master scale. He couldn’t just paint his illustrations on any size canvas and expect them to look great, whether reduced in size or enlarged. There were certain rules to follow to make the reproduction successful. Reproducing some paintings can destroy their impact. Rockwell’s work actually gained power in its reduced form, which was a result of his strong talent and understanding of the changes created in the printing process. Norman would usually set up a scene in his studio for the picture he was going to create. He insisted the details of the background be detailed and accurate. Sometimes he would send his wife all over town just to find the right shaped chair he had in mind for a particular scene. Rockwell hired his friends to pose for him in his scenes. Some models had to pose for hours and days at a time. Later, he would take pictures of the models so they wouldn’t have to pose for him for such long lengths of time. The process used by Norman Rockwell to create a painting was long and detailed. First, he sketched the scene. Next, he made individual drawings of each thing in the scene. Full-size charcoal drawings were the next step, followed by color sketches. Only then was he ready to begin actual painting. The pictures for the Post covers were painted on very large canvases. Rockwell felt the only way they would look good, when they were shrunk down to the size of a magazine cover, was to create the original paintings large and full of detail. As we view Rockwell’s work, it is as if we are looking into a mirror seeing our own life experiences happening. Norman liked to capture a moment on canvas just as we sometimes candidly capture a moment with a camera. His pictures make people smile, feel good and even laugh. They make people think and think again. The people Rockwell painted were not Hollywood heroes or beautiful models. They were mostly ordinary people, Norman’s neighbors and friends, who never did anything famous. His pictures tell a story…a story of grandparents, parents, children…of all Americans! Norman moved to a small town and used his friends and neighbors, even his sons as his models. In America, Norman Rockwell is the best known artist who has ever lived. Some art historians of the past felt that Norman Rockwell was not a true artist, merely a talented illustrator. Although he worked hard to make all of his paintings works of excellence, the art critics of his time did not take him seriously. These critics believed that Rockwell painted ideas and feelings that were too simple to be great art. This may have been exactly what made him so popular with ordinary people. Today, it is generally felt that Rockwell was definitely a very gifted and talented artist who brought a new dimension to the art of illustration. Norman called himself an illustrator although he always wished to create great artwork that the world would have considered Fine Art. Until Norman Rockwell, illustrators were not considered in the same category as major artists, or Fine Artists. He was his own worst critic and the first illustrator ever to have his paintings displayed in an important Gallery of Art. In 1963, a major Art Gallery in New York City displayed Norman Rockwell’s illustrations in their front window. This told the world that the famous illustrator was TRULY an artist—a Fine Artist! 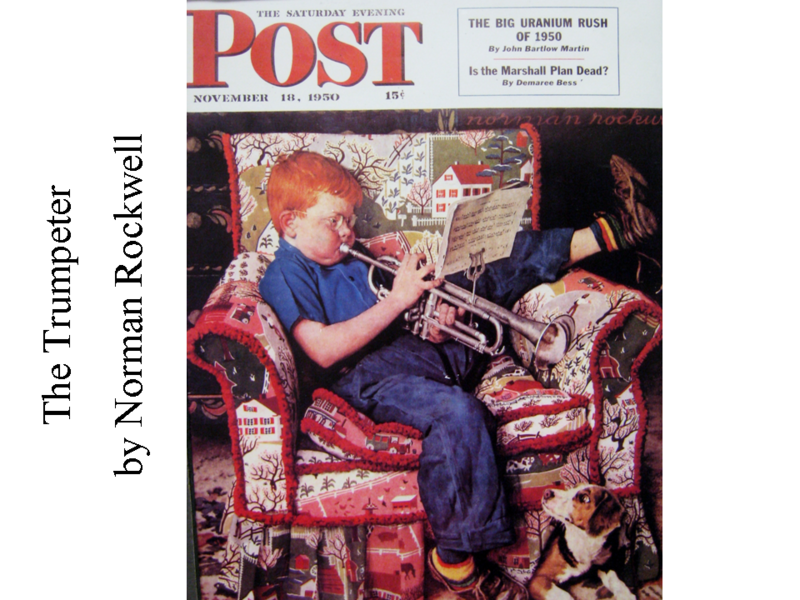 Norman Rockwell died on November 8, 1978, at his home in Stockbridge, Massachusetts, at the age of 84. His timeless paintings will still live on for many, many generations to come. Ask the class to look at the painting to see if they feel it tells a story. Help kids begin to “read” the painting by identifying the people and objects they can see. Ask the class to focus on the details of the picture that give clues to the story. What story does the painting tell? What do you think happened just before this scene? How do you think the people in the painting feel? What can you see in the painting that makes you think they feel this way? Discuss the different ways the painting allows everyone to have their own interpretations of the story. 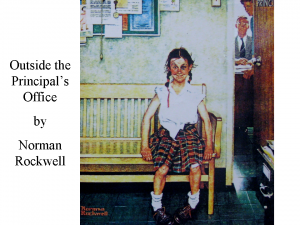 For example, there could be many reasons the girl in Norman Rockwell’s, Outside the Principal’s Office, has a smile on her face. Maybe she just won a race on the playground. Maybe something exciting is going to happen after school. Maybe today is her birthday! Artworks inspire viewers to participate in the story by using their imaginations. Introduce the class to a painting. Ask the class to use their imaginations and pretend they are inside the painting. What would it be like to be part of a (noisy, happy, silly, sad) scene like this? Where would you be standing or sitting? What can you see from this spot? What can you hear and smell? Do you feel warm or cold? Can you feel the breeze or the sunlight? Help the class identify various details and objects in the painting. Ask them to explain why these details are important. How do these objects make the scene seem real? Remind the class that the artist (Rockwell, Robert Gunn, Robert Tanenbaum, or Leslie Thrasher) created the scene they are experiencing without using words. The artist has appealed to their senses by carefully choosing elements and details that relate to our senses. Discuss these elements and details. What time of year would it be? Why would you make these choices? Throughout the 1960’s and 70’s, Rockwell works were featured on the covers of the Top Value Stamps gift catalog. Although Rockwell’s pictures did not illustrate the products from the catalog, they often had a humorous theme that gave the catalog a memorable appeal. This picture was created for the cover of a Top Value Stamps gift catalog. During the 1960’s, some grocery stores, department stores and gas stations gave customers a stamp for every dollar that they spent at the business. These stamps were collected in stamp books. When enough filled stamp books were collected, prizes could be ordered from the catalogue (like clocks or waffle irons) by sending in the number of filled stamp books the prize required, instead of actual money. Top Value Stamps was a company in the Eastern United States. In the west, two of the companies were S&H Green Stamps and Blue Chip Stamps. The boy in this painting is playing a guitar and singing. Our attention is first drawn to the boy with the guitar, in the center of the picture. The handle of the guitar leads our eyes up to the girl in the background, then back down, in a diagonal line, to the dog beside the boy. Notice how the three figures in the painting are in an angle that cuts the painting in half, from the bottom left corner of the picture to the upper right corner. Although we can’t actually hear how the music sounds, Rockwell has given us some clues. What kinds of clues did the artist paint for us about the picture? The girl in the background has a pained look on her face and her hands cover her ears. The dog appears to be howling. The boy seems to be using his entire body to sing. He seems oblivious of the girl or the dog and is totally absorbed in his singing. What kind of music is the “music man” creating? The clues lead us to believe it is NOT very pleasant. If the artist wanted us to believe the music sounded good, what might he have painted differently in this scene? The girl might have had a smile on her face and she might even have been dancing with the music. 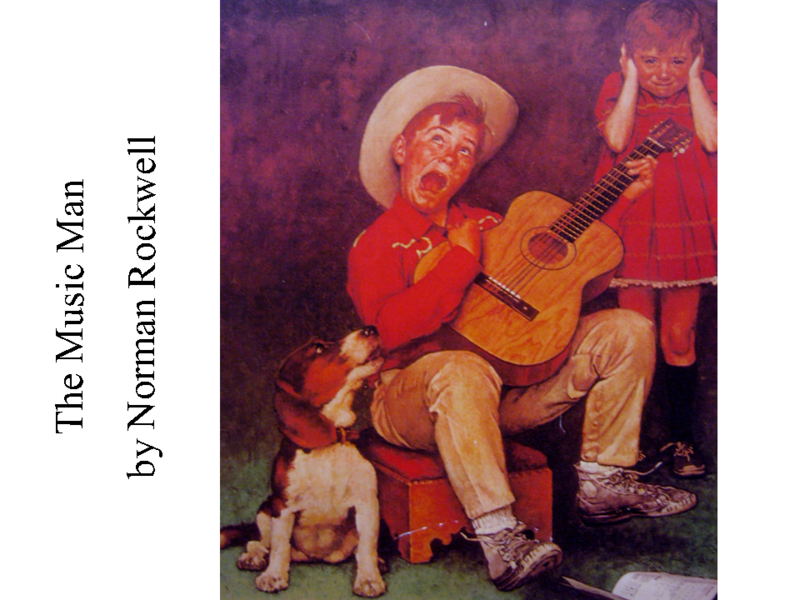 Compare this painting to The Music Man, by Norman Rockwell. Although we can’t hear the musicians in the painting, the artist has given us clues to figure out what the music sounds like. The mother has her eyes closed and seems lost in what she is doing, much like the boy in Rockwell’s Music Man. The boy in this picture strains as he blows his trumpet. Both artists included dogs in their pictures and the dogs are very similar. Robert Gunn’s picture also tells a story. Like Rockwell, Gunn’s painting shows ordinary people doing everyday things and both artists have painted something to smile about. Gunn’s painting has almost no background, except for a baseboard molding that divides the wall from the floor. This is similar to the plain background of The Music Man and Rockwell’s earlier Post Covers, which had simple backgrounds or no backgrounds at all. Who is practicing? What are the instruments? Is everyone happy? At first glance, the dog seems to be howling, which would normally tell us that the dog is unhappy. Remember, dogs have very sensitive ears. But when you look closer at the faces of the musicians and compare this dog with the dog in The Music Man, the dog seems happy and might just be singing. Everyone seems to be having a good time! What clues did Rockwell give us about the way the music sounds in this picture? Just like The Music Man and Practice Time, there is also a dog in this painting. However, the dog is NOT howling so the music in this picture must not hurt his sensitive ears. Rockwell used real models for the dogs in his paintings. He found the dogs in the dog pound. Norman felt that these dogs had a lot more character because they had experienced a harder life. Notice how this picture fills the entire page and is extremely detailed. This was common to Rockwell’s later Post cover pictures. What type of PATTERN do you see in the print of the chair fabric? Norman could have easily painted a solid color chair for the boy to sit in and the picture would still have been appealing to us. Instead, he has painted the chair with a busy print, which would have taken him much longer to paint. This is an example of Rockwell’s careful attention to detail. What other details do you notice in the painting? There is a dresser in the left background. It is decorated with tole painting. The rug is not just a solid color either; it has a patterned design. The boy’s left shoelace is untied. Rockwell has even painted the musical notes on the page the boy is looking at. Bring in some musical instruments for the kids to examine closely. Have kids choose an instrument that they would like to draw themselves playing in a picture. Getting to examine the instruments you brought in will help them create their own picture. If any of the kids in the class play a musical instrument, have them create a picture of themselves playing that instrument. Include a dog in the picture, to give the viewer clues about the way the music sounds. If the music sounds good, the dog would probably wag his tail, dance around or even have an expression resembling a smile. Someone else could also be in the picture to give another clue about the sound of the music. The person could smile, dance or laugh if the music sounds good and frown, hold their hands over their ears, or turn away if the music sounds bad. The pictures should show each person playing an instrument themselves (even if they don’t play an instrument in real life). The pictures can be funny or serious. Bring in and display some musical instruments at the front of the room and have the class create a picture of one of them. Bring in pieces of sheet music for the kids to examine. Have the class copy what the music sheet looks like and decorate the edges of the music with some type of design or decoration. Discuss what the different parts of the music are what they tell the musician to do. If you enjoy music yourself, it might be fun to explain and demonstrate how musicians compose and write down their music and the way each note sounds. You might play an instrument for the class. This packet allows a great opportunity to explore another type of art, if you are interested in music. The Boy Scouts of America was founded when Norman was 16. Rockwell began contributing to Boys’ Life scouting magazine in 1912, when he was hired to illustrate one of the Boy Scout handbooks. At the age of 19, Rockwell became Art Director of the magazine. Some of Norman’s earliest published works appeared in the Boy Scouts Hike Book. He had a loyal relationship with the Boy Scouts of America for the rest of his life. For more than 50 years, Rockwell painted scouting images for the yearly Boy Scouts of America Calendar. Most of the pictures actually featured real scouts from Rockwell’s hometowns. 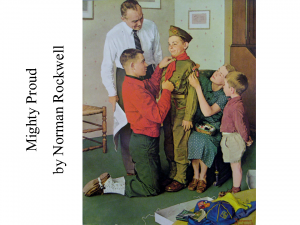 The Boy Scouts of America was passionately supported by Norman Rockwell throughout his lifetime. The main character in this painting is a boy who is advancing in the Boy Scout program. The boy’s old cub scout uniform is on the floor, in the right foreground of the picture. The boy’s mother is busy sewing award patches on his new uniform. She has a basket filled with thread in her lap and is adjusting the next patch she will sew on. The boy seems pleased with the attention. He has a smile on his face and stares dreamily as his mother and older brother adjust and straighten his new uniform. The boy’s father has a newspaper in his hand and is probably saying some encouraging words to his son. We see a younger brother on the far right, admiring his brother. This scene seems to be an important and happy family activity. The whole family seems to be supporting and encouraging their newly advancing Boy Scout. The scene illustrates a step in the process of growing up. Rockwell loved to paint happy families doing things together. He felt that even if the world wasn’t perfect, he could make the world seem better by painting happy, fun and uplifting pictures. Norman painted during some hard and sad times of America’s history. Throughout two World Wars and the Great Depression, he painted pictures that made America seem like a wonderful place to live and helped Americans focus on the happier things in their lives. Discuss how Norman Rockwell’s paintings might have encouraged people during War times or the Great Depression. Briefly, discuss the sadness and hardships these times in American history may have held for some people. Rockwell painted this picture in 1946. By this time, his style of painting had become very detailed. Norman would carefully choose the furniture, the clothing and other details seen in the backgrounds of his paintings. When an idea of how a painting should look appeared in his head, Norman worked very hard to make it look just right. He would carefully demonstrate the facial expressions he wanted his models to have or the way he needed the models to stand or pose. Rockwell painted from live models until the mid-1930’s. Eventually, he used photographs of his models to create his paintings. What do you think the title of this painting means? 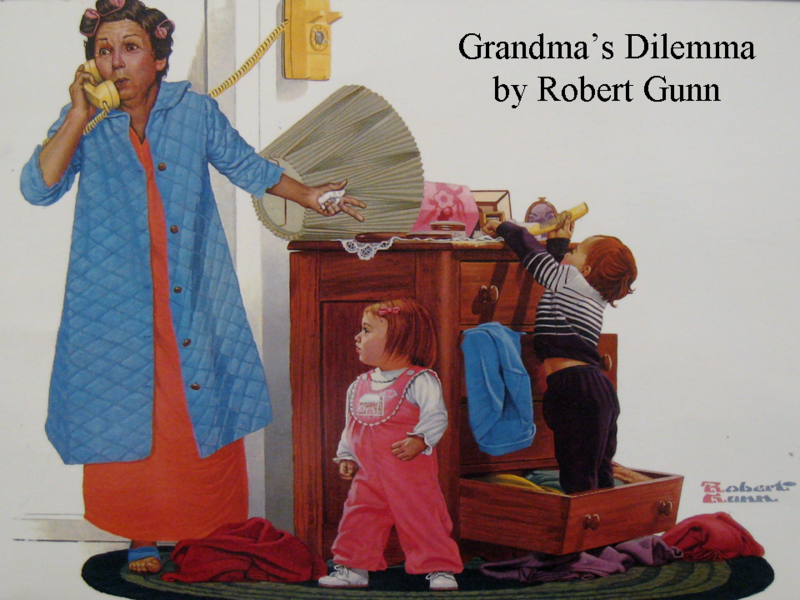 How is this Robert Gunn painting different or similar to a Norman Rockwell painting? 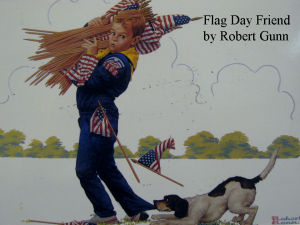 Scouting and patriotism were important themes in many Rockwell paintings and so were young boys paired with their dogs. Rockwell’s paintings usually capture a moment in a story. What type of story is going on in this painting? The Scout is carrying an armful of flags for Flag Day. He begins to drop them as the dog suddenly grabs the bottom of his leg. The boy’s face looks worried. Is he going to drop all the flags? What do you think will be the next scene of this story? How is the background similar to, or different from a Rockwell painting? 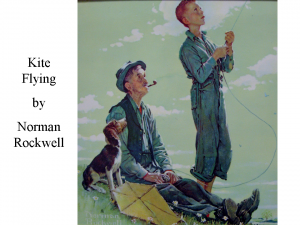 The background is very simple, like Rockwell’s earlier paintings, but the trees and clouds are a little too “cartoonish” for a Rockwell painting. Rockwell worked hard in his paintings to be photographically REALISTIC. Norman had a large wardrobe for his models to wear. He collected them all over the place. When Norman created illustrations for Mark Twain’s Huckleberry Finn and Tom Sawyer, he went all the way to Hannibal, Missouri to see how life looked there and how the people dressed. While walking down the streets of Hannibal, Norman stopped people who had the kind of look he wanted for his book illustrations. He paid the people for the old clothes they had on. Norman took the clothes back home to his studio, for his models to wear while he painted his book illustrations. Once Norman wanted to paint a particular pair of pants that a farmer was wearing, in one of his pictures. Norman and the farmer went behind a tree and traded pants. The farmer got a newer pair of pants and Norman paid the farmer for the worn and dirty pants he had traded. This painting illustrates three dominant Norman Rockwell themes—a boy with his dog, old age pleasantly interacting with youth and the sport of fishing. Rockwell often liked to show grandma or grandpa doing happy things with the grandkids—like grandpa and grandson on an afternoon fishing excursion. Norman Rockwell loved to illustrate the cycle of life—from childhood to college, to jobs, courtship on to marriage, children and grandchildren. He also loved to paint happy, carefree summer days, where kids and adults went swimming, flew kites, played ball or went fishing. Rockwell painted many, many pictures featuring fishermen. Create a picture of you, with someone else, fishing. Create a picture of something you like to do with your grandma or grandpa or your mom or dad. Older kids could write a paragraph that tells about what they like to do with the person in their picture and attach it to the bottom. This kind of picture would make a great gift. Paint a picture of your family doing something fun together. Create a picture of you with your dog. If you don’t have a dog, create a picture of you with the dog you might LIKE to have. If you have a cat, create a picture of you and your cat, or any other pet that you have. If you don’t have a pet, create a picture with the kind of pet you would LIKE to have, if you could have any kind of an animal for a pet. The picture could be serious or funny. 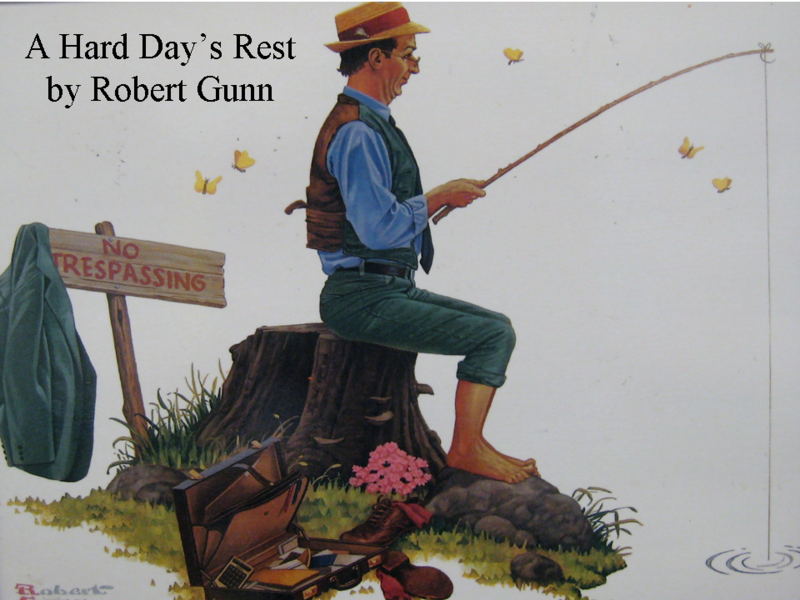 Not only has Robert Gun copied the fishing theme from Norman Rockwell, but he also borrowed a different theme that Rockwell used in several of his paintings—the hard working man relaxing on a warm afternoon. What does the title mean? Is the man working hard to relax? What types of clues has Robert Gunn illustrated to tell us what the man does for a living? What kind of story does this painting tell? Create a painting of yourself fishing, all alone, on a hot summer day. Here’s another happy Norman Rockwell painting that tells a story. What is happening here? This is a picture of a grandpa surprising his little grandson with a puppy. That big smile on grandpa’s face gives a clue he is having fun with his grandson. What clues tell us that this is one of Norman Rockwell’s earlier paintings? Besides the date on the magazine, the Logo for the cover is in the older style. The older style had very simple backgrounds or no backgrounds. The clothing styles of the little boy and grandpa are more old fashioned. Create a picture of a surprise one of your grandparents or parents gave you. If you can’t think of a real surprise , create a picture of a surprise you WISH they would give you! Create a picture of yourself as a much younger child being surprised with a special gift from your parents or grandparents. Create a picture of you opening a gift on Christmas morning that was a big surprise! What is a Dilemma? A difficult or perplexing situation or problem. What is grandma’s problem? Why does she have that expression on her face? Who do you think she is talking to on the telephone? What room are they in? 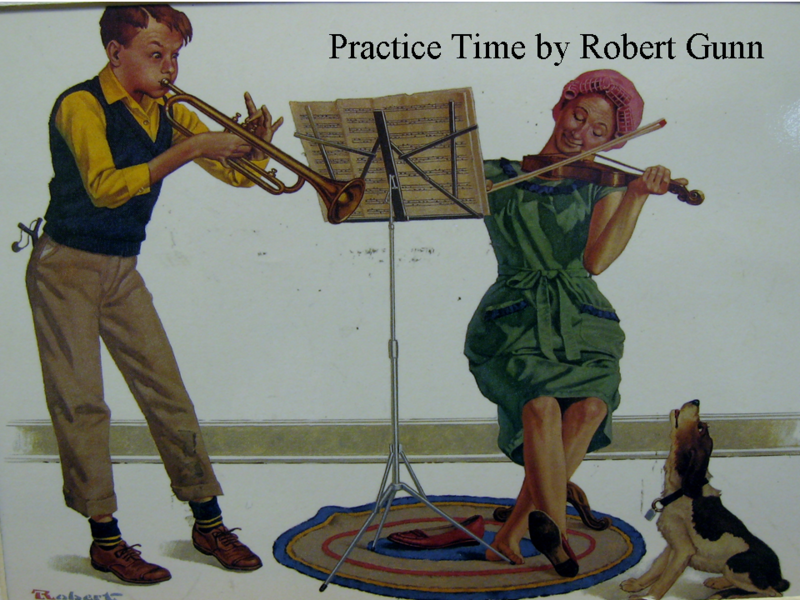 What familiar Rockwell theme has Robert Gunn borrowed in this picture? Gunn has created an interaction between grandma and her young grandchildren. His picture gives us clues to tell a story. Does grandma’s expression make you worry? No, the picture makes us laugh and many parents or grandparents could probably relate a similar situation. Who is flying the kite? At first, it looks like the boy is flying the kite and grandpa is watching. Then you notice the boy is helping grandpa with his kite. The boy’s kite is lying on the ground, in front of the dog. Paint a blue sky with a few white clouds, using watercolors, on a sheet of white paper. Create clouds by leaving unpainted negative shapes of white. Glue on several diamond shaped, colorful paper kites, with strings attached, to create a picture of a kite or kites flying in the sky. In Rockwell’s illustrations, we see doctors that we can totally believe in. Whether the patient is a little girl’s doll or a live person, we can always be sure of one thing—the patient will be healed! 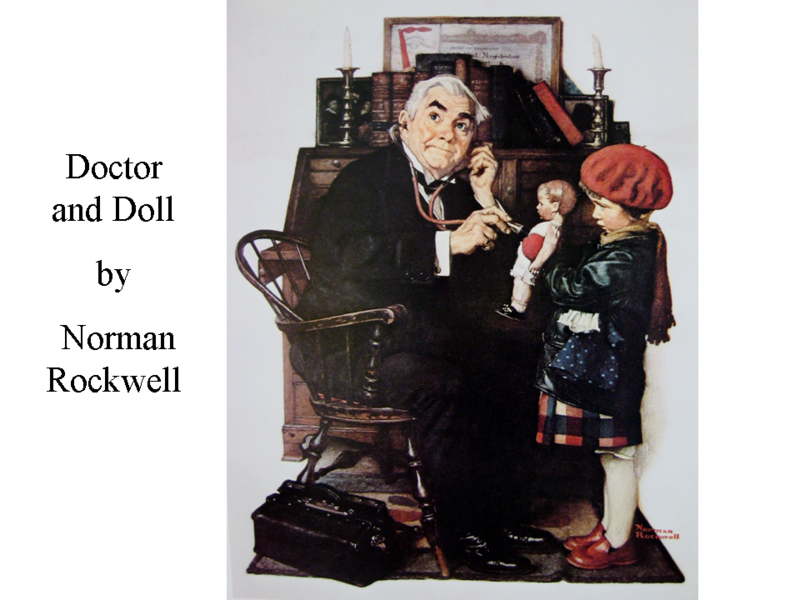 The model for this painting was Rockwell’s real-life doctor, Dr. Donald Campbell. The girl was a neighbor of Norman Rockwell. The black bag on the floor used to be a typical symbol of a country doctor who made house calls. He would carry some of his instruments and pills with him in a black bag like this one. What is happening in this painting? The doctor is using a stethoscope to examine the little girl’s doll. Robert Tanenbaum also produced painted illustrations and drew preliminary sketches for movie posters, during the 1970’s and 1980’s. Some of the movies Tanenbaum created poster illustrations for include: “Foul Play” (1978) starring Goldie Hawn and Chevy Chase, “Somebody Killed her Husband” (1978) starring Farrah Fawcett-Major and Jeff Bridges, “Meteor” (1979) starring Sean Connery and Natalie Wood, “Beastmaster” (1982) with Marc Singer, “Ruthless People” (1986) starring Bette Midler and Danny DeVito, and “Pirates” (1986) starring Walter Mathau. Hollywood no longer uses “illustrated” movie poster advertisements in the exclusive way it did during the beginning and earlier years of full-length feature films. Modern technology (digital photography and computer animated graphics) have changed the look of movie advertisements today. What is happening in this painting? 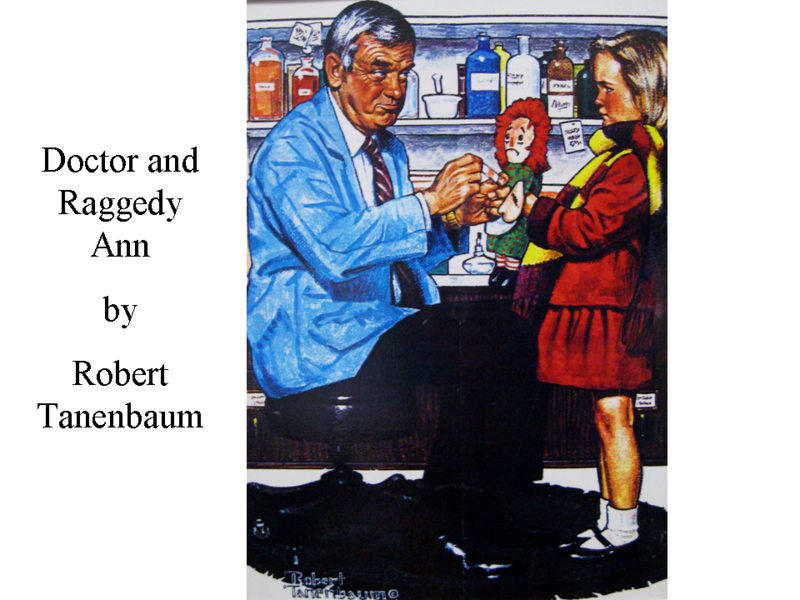 Raggedy Ann’s arm is torn and the doctor has come to the rescue with a Band-Aid to fix it. How is this painting similar to the Norman Rockwell painting, Doctor and Doll? Both girls are bundled up for the cold, with a coat and neck scarf. Both girls have a serious look on their faces. They are worried about their dolls. Both doctors have gray hair. Both doctors have serious looks on their faces. Both doctors are sitting in a chair, although the chairs are different. Both girls are holding their dolls up for the doctor to examine. How is this painting different than the Norman Rockwell painting? The doctor in this painting has a more modern cabinet behind him. There are medicine bottles on the shelves behind him. The Norman Rockwell doctor has a wooden desk behind him with candles and books and his framed medical license on the wall, behind the desk. This doctor is wearing a more modern suit. He is fixing the doll with a more modern day remedy—a Band-Aid. Younger classes can create a Raggedy Ann or Raggedy Andy doll using the patterns. It works better to run the pattern off on cardstock. Glue pieces of red yarn on the doll’s head for hair. Color their striped socks and clothing any way you wish. 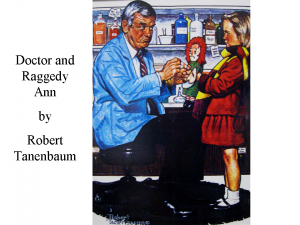 To make a doll like the one in Robert Tanenbaum’s picture, bring in small Band-Aids to put on the doll’s arm. You can also use the clothing as patterns to trace on patterned wrapping paper or wallpaper, for a different look. Use the patterns to create a child dressed in winter clothes, like the girls in these paintings. Glue them to a winter background, created with crayon and white chalk, on a piece of gray or black construction paper. This project appeals to younger classes. Leslie Thrasher began his illustration career in the early 1900’s and it didn’t take the talented artist long to make his own mark in the field. Thrasher quickly earned a reputation as one of the top artists in his profession. Liberty magazine signed him to a long term contract (virtually unheard of at the time) to produce their famous series of “continuity” cover illustrations in the mid- to late-1920’s. That series, known as “For the Love o’ Lil,” became so popular with readers that his characters were eventually featured in both a big screen film and a radio serial of the same title. Today, Thrasher’s name is as synonymous with Liberty magazine as is Norman Rockwell’s with The Saturday Evening Post. Thrasher’s talent was not limited to magazine covers, as he also contributed to many well known advertising campaigns, including Cream of Wheat. Norman Rockwell never faked anything in his pictures. His characters were as real as the clothes they wore. Norman had a wardrobe of over 200 costumes for his models to wear. He posed his models with everything he wanted painted in the picture. When Norman wanted a picture of a kid with a black eye, he advertised for a model with a real black eye. At first, Rockwell used only live models to pose for his paintings. Most of his models were his neighbors and some were his own sons. Norman would have these models pose for days or weeks, until he got the painting just right. Eventually, Norman started using photographs of his models to paint with. This made it easier on the models and insured Norman would continue to have a steady supply of models (since he didn’t wear them out by posing for so many long periods). Norman was very detailed and thorough. Sometimes he would take as many as 100 pictures for a painting. What is the same about these two paintings? Both of these kids have a smile on their face. They both have messed up hair and a black eye. What happened just before these scenes that these artists have shown us? The boy and the girl have each been in a fight to get their black eyes and each has a smile on their faces. What is different about the two paintings? Different artists painted each of the two paintings. There is no background behind the boy but the Rockwell painting has a very detailed background. The boy is holding a basketball and the girl isn’t. The girl is sitting on a bench outside the door of the Principal’s office. 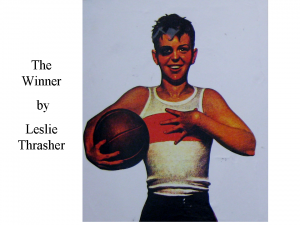 There are two other people in the Rockwell painting and there is only one in the Thrasher painting. In the right background, we can see what looks like the principal and his secretary. It seems like the girl is going to get in trouble from the principal for fighting. The girl doesn’t seem to be worried about the Principal. If someone in the class has a black eye, have them sit at the front of the room. The class can create a portrait of the person. It will take less time to just draw a close up of the face. You could bring in a hand mirror so the person posing would be able to draw himself. The person posing will have to be sure to look at the class from time to time so the class can have enough chances to see their black eye. Create an artificial black eye for yourself (with make up) and pose at the front of the class. Let the kids create your portrait. Make up a funny and wild story to tell the class, while you are posing, about how you got your black eye. The kids might draw a scene from your story, featuring you as the daring hero! Write a short story to fit a Norman Rockwell picture. Create a picture that tells a story. Fourth and fifth graders can write a story to explain their picture. Write just enough to explain the moment of the scene, what happened just before the scene and what will happen next. Attach the story to the picture and display. Use one of the two Saturday Evening Post cover outlines pages for your illustration. (Print logos on 11” x 17” paper) Display the artwork with the magazine logo designs, at the front of the room, as you explain this project. There are two different styles of cover design—one is the earlier style, which had little or no background. The older cover style is easiest for younger kids, who create much simpler pictures. The second cover design style (with the large outlined POST) was used when Rockwell created his later illustrations with very detailed backgrounds. The picture completely filled the page underneath the magazine logo. Point out this difference to the class, using the print examples. The later logo will challenge 4th and 5th graders to completely cover the page with their detailed pictures. It would also be fine to give older kids a choice of the design style they prefer. Most of the pictures in this packet were originally Post covers but few are shown here, complete with the magazine logo. Point out that the class will need to fill in a date for their magazine cover and a price. Point out the way the later magazine style cost a little more (inflation). Also, point out the titles listed on the cover, for the articles to be read inside the magazine. Challenge 3rd-5th grade students to come up with a few funny or clever titles to write on their own covers. Make sure the cover illustrations tell a story without using words. Norman Rockwell painted many pictures to illustrate calendars. 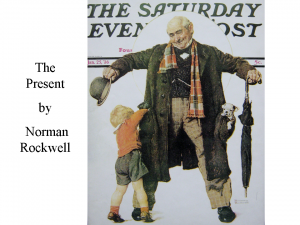 Today, Norman Rockwell Calendars are still very popular. Use the calendar outline page to illustrate a month of the year. You might want to choose your birthday month…favorite holiday…favorite season…month when your favorite sport occurs…or a month when something important happens in your family. Fill in the name of the month and the correct dates. Be sure your picture tells some kind of story. 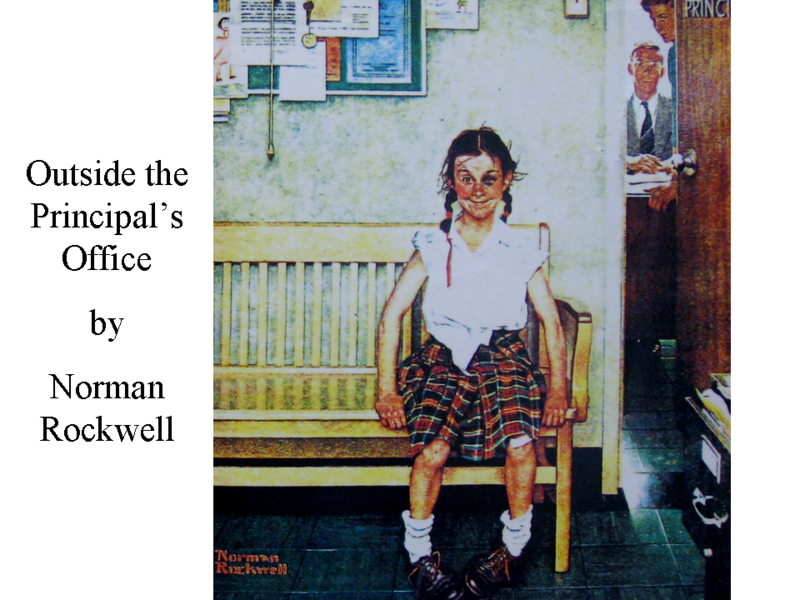 Collect enough Norman Rockwell Calendar pictures or cards for each student to have one. Try to find a variety of scenes that are different than the ones found in the packet. Have everyone draw a picture of the scene that happened just before or just after the scene you passed out to them.